Location, location, location! That’s the ticket to a successful Garage Sale! We have always combined forces with family and held our garage sale at a primo location just off a major highway. Alas, that location has been sold. What’s a person to do? Our only option was to hold a garage sale at *gasp* OUR HOUSE! Our house that is tucked away on an off shoot, off a cul-de-sac, up the hill, with a steep, sloped driveway that in no way shape or form would leave merchandise on a table if we dared to pull them out. There is NO CHANCE for a stealthy drive by at THIS location and parking is a nightmare. 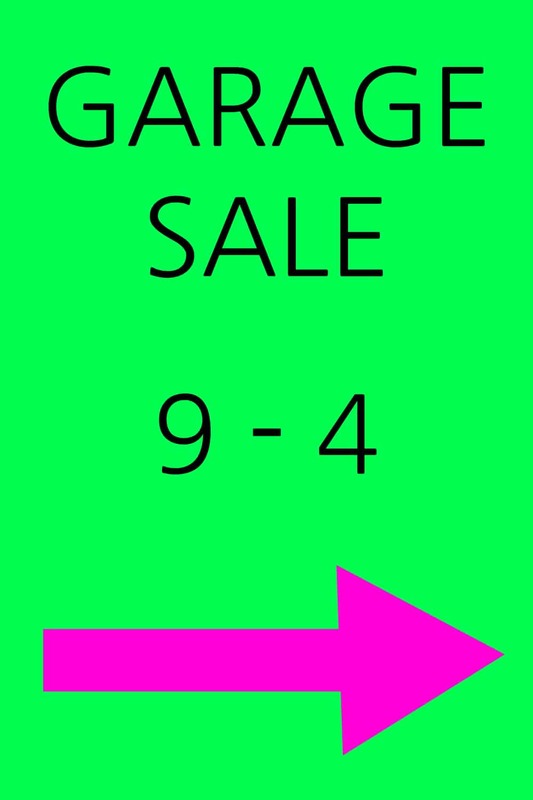 The bonus is, garage sale goers will get a mighty fine work out walking up to this sale! 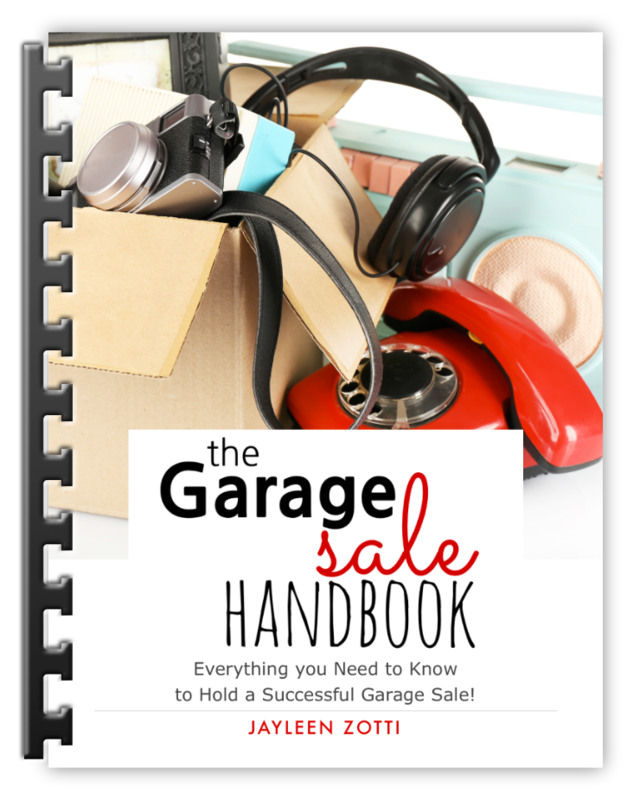 With fear and trepidation, we pressed forward doing all the garage sale stuff you’re supposed to do, not knowing if any sane soul would make the treck. To our pleasant surprise, there were customers galore! Sure, some were sweaty and moving slow by the time they made it to the garage BUT they made it! They bought stuff too! After all, the treck back down is much easier! What convinced these folks to go over the river and through the woods for a garage sale? It seems so simple, right? Time after time I thanked customers for finding us in our out of the way spot and you know what they said? Over and over again, customers raved on our signs! It’s not that they were terrific or anything fancy. No balloons or fanfare. Just simple BIG signs on A-Boards! This post contains affiliate links. See our full disclosure! Pick two attention grabbing colors! Use ONE color for the background and the other color for arrows! For our latest sale, we used bright green and hot pink. 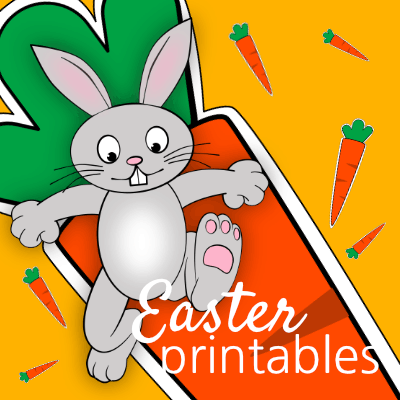 You can easily find poster board at Rite Aid, Wal-Mart, or even The Dollar Tree. These markers are perfect for getting the job done! You may already have one! If not, you’ll find a staple gun is useful for so many things. Use it to staple your signs onto A-Boards. Remember not to staple or nail any signs on telephone poles. Those pole climbers will thank you for it! A-Boards can be a big investment but they are incredibly effective! Do a quick search and discover how to build your very own A-Boards! Place an A-Board at each turn from the main road. We happen to have six A-Boards and utilized each one although we could have easily gotten away with four! Potential customers need the basics and they need them FAST as they drive by. ARROWS! You gotta have arrows! There’s no need to list what’s for sale, an address, or even dates and days. If you list Thursday, Friday, and Saturday, everyone will know the sale has been picked over by Saturday and won’t bother stopping. You may want to be all cutesy and write funny things on your signs. While that may be incredibly fun, most people won’t have time to read your clever words, they just want arrows! Tip: If your sale is close to a main road, you can boast ‘3 Blocks’ (or whatever it is) and you’re certain to compel more people to stop in! That’s it! Super simple, BIG, clear signs with giant arrows on A-Boards! 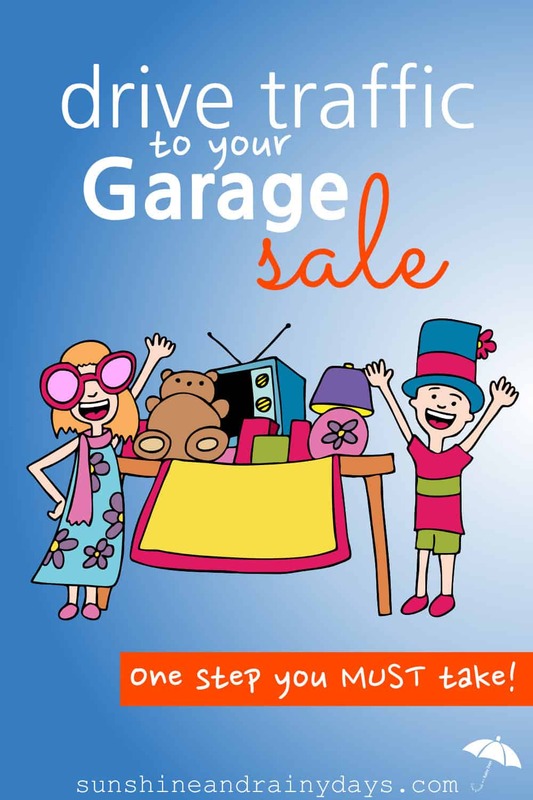 It’s the one step that will drive traffic to your garage sale even IF you live over the river and through the woods, and up a hill with no good parking! I’ve got $758.68 to prove it! TeeHee! ‘Sign-ery’, is that a real word? If not, I like it! I agree too, there are signs everywhere and you just don’t know if they are current. I should add to the article, one last thing you MUST do, take down your signs! I thought of you the other day – I drove by this awesome old fashioned marketplace we have in our quaint New England. They were drawing attention to a sale they were having that day, and they had a little aframe out by the road – and I remembered this was your advice! What made it stand out even more to me was that it was a child’s art easel. We actually have one ourselves – whiteboard on one side, and a magnetic chalk board on the other. They are made to not tip over easily, but are also light weight. And if you don’t currently own any a-frames, but you are friends with families with small children, you might be able to borrow something like this. Oh my goodness! What an excellent alternative! You ROCK, Kirsten!